About 500 light years away from Earth, CI Tauri, also known simply as CI Tau, is a star smaller than the Sun which is very young in astronomical terms, having an estimated age of about two million years. That space region is a sort of cosmic nursery where many stars formed in relatively recent times and are forming, probably along with many planets yet to be discovered. In 2016 the discovery was announced of a giant gas planet with a mass higher than Jupiter’s that orbits CI Tau. Many gaseous exoplanets were discovered but it was the first time that a hot Jupiter, a gas giant very close to its star that gets heated by it, was discovered in such a young system. Many astronomers think that hot Jupiters form in an area farther away from their star and then approach but the case of CI Tau b seems to contradict that model. The ALMA (Atacama Large Millimeter/submillimeter Array) radio telescope, inaugurated in March 2013, is an excellent Instrument to study protoplanetary disks in which new planets are forming or have just formed because many electromagnetic frequencies are blocked by dust and gas still present but radio waves pass through them. In the case of the CI Tau system, the disk revealed three new gaps that have characteristics that indicate the presence of three other gas giant planets. An interesting discovery is that the four exoplanets’ orbits are very diverse. The one already known is closer to CI Tau than Mercury is to the Sun. The outermost exoplanet is far from CI Tau more than three times as far as Neptune is from the Sun. The two innermost planets have masses that were estimated around at one and ten times Jupiter’s while the two outer planets have masses similar to Saturn’s. This new discovery also raises new questions. 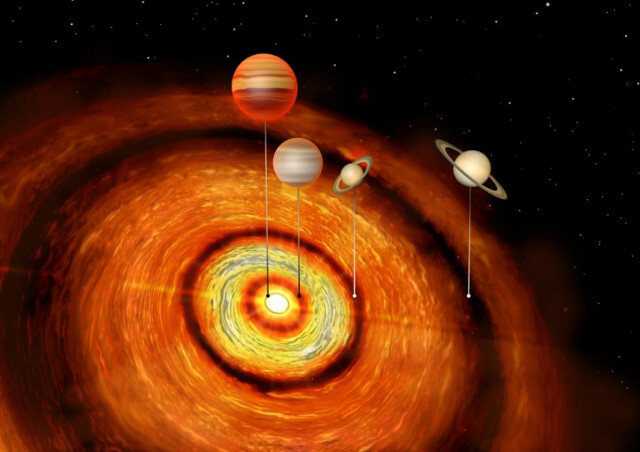 According to current models, the planets with a mass similar to Saturn’s form from a solid core accumulating gas in a slow process that takes place far away from their star. Again the system seems too young for such a process to be already so advanced. Surely the CI Tauri system will be the subject of further study to understand if it’s an anomalous case and if so astronomers will try to understand the origins of its diversity. Such cases may offer new important information to improve our models on planetary formation. Instruments such as the ALMA radio telescope are crucial to study these processes but the amount of systems under study is still limited so it’s possible that there will be more surprises for the researchers.